Following its radio debut in 1928, The Voice of Firestone aired on television between 1949 and 1963. Some of the world's most promising newcomers and established stars sang classical songs and current hits while Howard Barlow and his 46-piece orchestra accompanied them. Many of these telecasts are now available as part of this In Opera and Song series. 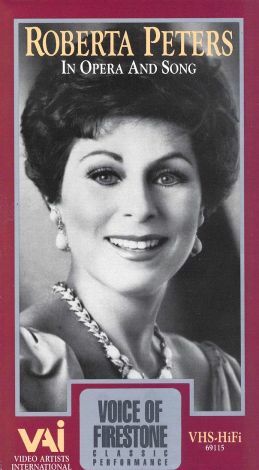 This volume features soprano Roberta Peters singing popular tunes and arias from Lucia, The Magic Flute, and La Traviata. Peters made her operatic debut in 1950 when she played the role of Zerlina in Mozart's Don Giovanni.